The magnificent creations of nature have never failed to impress us, even the grumpiest one. Coming to Can Gio – Vam Sat Eco-park, you will be amazed by the astonishing natural species here. Vietnam Travel Group’s private tour will give you the fullest experience in this wonderful place. What is Can Gio – Vam Sat eco-park, Vietnam? What is Can Gio biosphere preservation, and what is so special about it? On January 21, 2000, Can Gio forest was recognized by UNESCO as the first world biosphere reserve in Vietnam. With diverse, unique and rich flora and fauna, typical of mangrove reserves, this place has become a national key tourism area of Vietnam. 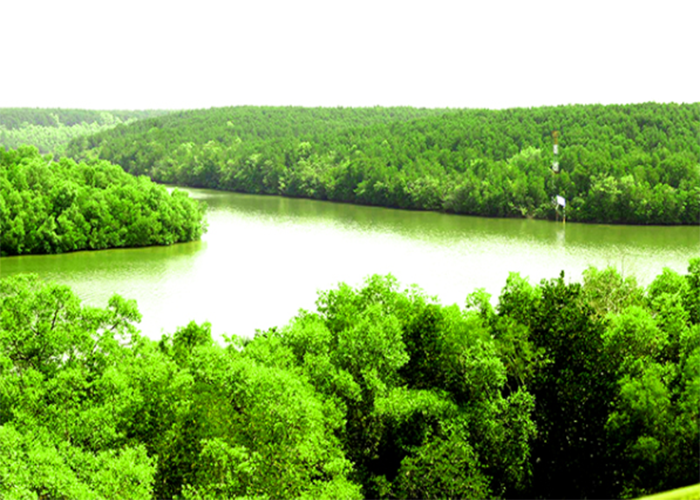 This is one of the mangrove forests with diverse and rich flora and fauna populations. In particular, there are many rare and precious animals such as long-tailed monkeys (Macaca fascicularis) and many other birds and storks. In the past, Can Gio biosphere preservation was a mangrove forest that had no human impact, thus maintaining a natural and wild landscape with extremely rich flora and fauna. However, bomb and chemical warfare had turned this place into a “lifeless” land. After more than 30 years of restoring and protecting, the Can Gio forest has become the largest mangrove forest in Vietnam with beautiful natural landscapes, extremely rich and diverse flora and fauna. The level of biodiversity is increasing both in species and number of individuals. Until now, the area of green forest covered more than 31 thousand hectares, of which nearly 20000 hectares of planted forests and more than 11 thousand hectares of natural forests have been regenerated. Thanks to the recovery, development and protection of Ho Chi Minh City local people, the place has become “The lungs of Ho Chi Minh city”. Thanks to its magnificent natural species, the massive green forests and the refreshing air, Can Gio biosphere preservation has quickly become one of the most favorite places for travelers who enjoy trekking, picnic or just simply wanting to relax and get away from tiring daily life. Mentioning Can Gio, we can’t ignore Vam Sat. Vam Sat is a famous eco-tourism site located in the Can Gio biosphere preservation, in Ho Chi Minh City, about 45 kilometers from the city center. Vam Sat was formed from a campaign of reforestation for Can Gio forest by the Youth Volunteers Force in 1979. In 1999, Ho Chi Minh City handed over Vam Sat to Phu Tho Tourist (now Phu Tho Tourism Service Joint Stock Company) to manage and trade tourism. With this conversion, Vam Sat has become an attractive eco-tourism area, attracting a large number of domestic and foreign tourists. Coming to Vam Sat Ecotourism Zone, you will be able to explore many mangrove forests, visit Doi Nghe reserve, catch crabs, conquer Tang Bong tower, walk to explore the road through forest, visit natural zoo, crocodile fishing boat, sway on suspension bridges, visit the Bird Sanctuary and enjoy countless delicious seafood in Vam Sat Tourist Area. Tourists coming to Vam Sat eco-tourism site can’t help but be awed with the numerous interesting activities they can do here. Joining the tour with Vietnam Travel Group, not only you can drown yourself in the beautiful nature, escape from the tiredness from daily life but also experience so many wonderful activities in the place. This is also a great opportunity to learn about the amazing natural world around us. The Can Gio – Vam Sat private tour only last for a day, which is quite suitable for both your schedule and budget. So why don’t you join us right away? What will you do in Can Gio – Vam Sat eco-park? To make sure you have the most wonderful and memorable day, Vietnam Travel Group has designed an interesting itinerary for you to explore Vam Sat, Can Gio. First, you will experience visiting the Bat Sanctuary Swamp by boat. The Bat Sanctuary is one of the areas attracting guests in Vam Sat, here you can easily face the bats which rarely contact humans. In the natural food chain bats play an important role, they catch and eat insects, help flowers pollinate by sucking bile and spreading pollen. In the Bat Sanctuary Swamp, in addition to watching the habit of living off this animal, you can also try your talent with crab fishing. The crabs in the tree holes look big and fat, crab fishing is not difficult at all but if you are not persistent and skillful you will likely not have a delicious crab meal. When visiting the Bat Sanctuary Swamp, you must always remember to keep quiet and not make a noise, because during the day it is time for bats to regain their strength after a night of tired hunting. 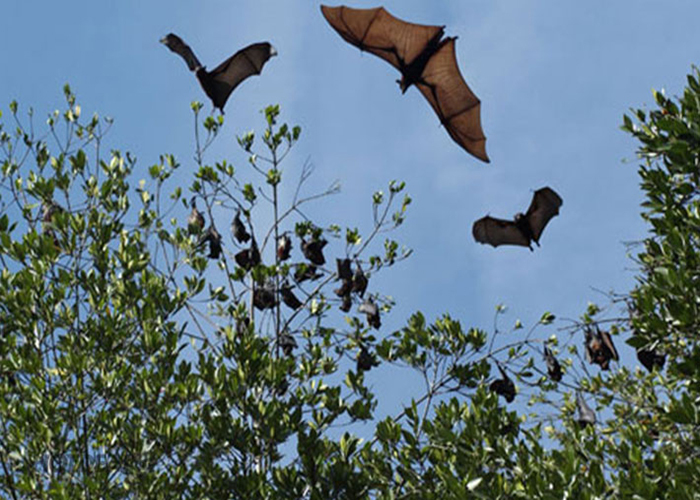 Bats sleep in a flock, hanging upside down on a tree branch, mother bats holding her baby sleeping, the whole flock clinging together on a spawning branch to keep warm and guarding each other, alerting each other when in danger. A loud noise may wake them. Next, you can try your brave with crocodile fishing. It is not a simulation game, but a real crocodile, aggressive, strong but move gently in the lagoon. When you release the bait and they use the strong jaw, the fight begins. Your hands will have to withstand the power of a wild animal flipping a circle to tear up the bait. 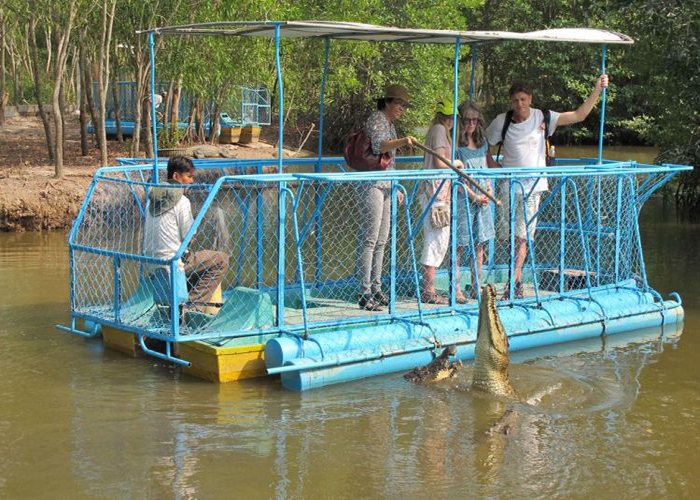 The number of crocodiles preserved in the lagoon area is about 40, when you go fishing, you will stand on a boat covered with B40 steel net with the height of the face, so you don’t have to worry about safety at all. You also can climb up a 26 meters high Tang Bong Tower to see the whole amazing view of the mangrove forest. And make sure you eat enough during lunch for energy to visit Vietnamese Birds’ Nest Exhibition Center in the afternoon. These activities may be tired you a bit, but Vietnam Travel Group can guarantee that it is worth the effort. 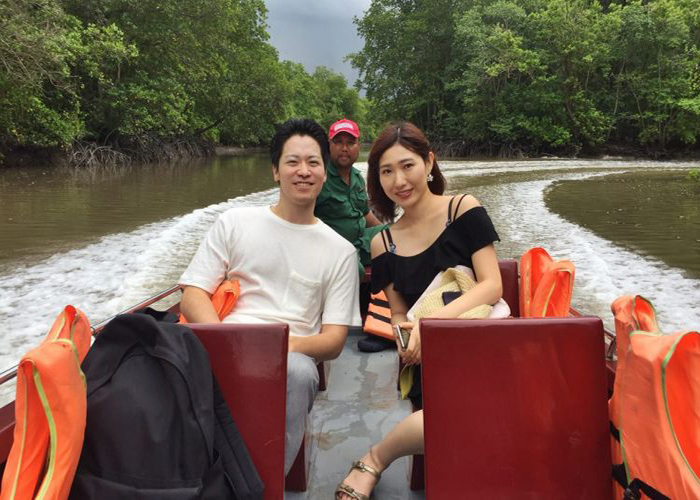 Book Can Gio – Vam Sat eco-park private tour now! The astonishing nature and the wonderful activities in Can Gio – Vam Sat eco-park are waiting for you to explore. Why not join us today? For more information, don’t be hesitate to visit vietnamtravelgroup.com or just contact us. The experience will absolutely not let you down. Vietnam Travel Group is pleased to serve you in Can Gio – Vam Sat, Vietnam. Wish you a good day and a wonderful vacation.